If you have irritable bowel syndrome (IBS), knowing what to eat can feel like the holy grail. For some patients, the right diet, along with attention to exercise, can control symptoms without medication. For my patients, I often recommend a special diet of easily digestible food, called a low-FODMAP diet, which is detailed in this chart. 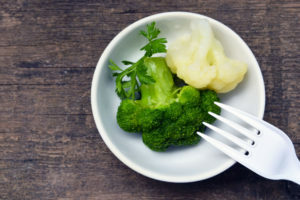 FODMAP stands for “fermentable oligo-, di-, and monosaccharides and polyols” – a mouthful to say, but in more common terms, FODMAPs are carbohydrates that may not be digested or absorbed well. Undigested carbohydrates are then metabolized by intestinal bacterial to produce excess gas, which leads to abdominal pain, diarrhea and/or constipation. Lactose is found in milk and other soft dairy products like cottage cheese, cream cheese, ice cream and sour cream. Anyone can handle a very small amount of lactose, but if you eat more than your intestine can handle, you will get gas and abdominal pain. About half the population is born with low levels of lactase, which metabolized dietary lactose. What to eat instead: Try lactose-free milk, oat milk, rice milk or soy milk as good alternatives to cow’s milk, as well as lactose-free yogurt. For cheese, try any of these three: hard cheeses, brie and camembert. Need butter? Go for olive oil instead. Fruits contain the sugar fructose, which can cause issues for IBS sufferers. Fructose is particularly high in apples and pears, and somewhat high in watermelon, concentrated fruit, dried fruit and fruit juice. Fruits with lower levels of fructose include bananas, citrus, grapes and berries. What to eat instead: Eat fruits that are lower in fructose, such as banana, blueberry, boysenberry, cantaloupe, cranberry, grape, orange, lemon, lime, kiwi and strawberry. Certain vegetables cause gas and abnormal bowel habits. 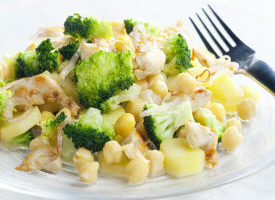 Avoid cruciferous vegetables such as broccoli, cauliflower, cabbage, coleslaw and sauerkraut. Also, limit artichoke, brussels sprouts, onions, shallots, leeks, and asparagus. What to eat instead: Vegetables that are good to eat include eggplant, green beans, celery, carrots, spinach, sweet potato, yam, zucchini, and squash. For more good options, see this chart. You can enhance flavors of these veggies with herbs. On the safe list, you’ll find: basil, chili, coriander, ginger, lemongrass, marjoram, mint, oregano, parsley, rosemary and thyme. Legumes, or beans, are often called the “musical fruit” because they contain indigestible saccharides. Baked beans, chickpeas, lentils and soybeans have high amounts, and IBS patients should avoid them, or eat them in very small quantities. What to eat instead: While not exactly a substitute for beans, you can enjoy rice, oats, polenta, millet, quinoa and tapioca. Also, as long as you do not have Celiac disease, you can eat gluten on a low-FODMAP diet, which is an inaccuracy of the chart. Polyols, sugar substitutes found in sugarless gum and candy, also can cause problems. Avoid them, including sorbitol, mannitol, isomalt, maltitol and xylitol. What to eat instead: It is perfectly fine to eat (in moderation, of course) good old-fashioned sugars; other artificial sweeteners that do not end in “ol,” such as NutriSweet®; Splenda®; and honey substitutes such as maple syrup, molasses and golden syrup. Sometimes IBS is treated with medications, but a change in diet is the first thing we try. A healthy lifestyle — with a low-fat diet, exercise and avoidance of alcohol and cigarette smoking — often makes a great difference. For people who still need help, special diets, such as a low-FODMAP diet, can provide relief. The good news is that a low-FODMAP diet is not a terribly restrictive diet. When you study the FODMAP chart, you will find there are plenty of good foods you can eat. Your doctor may find that medication is also necessary to keep your symptoms at bay. These therapies include anticholinergic medicines, which calm the spasms, and antidepressants to reduce stress.